After being unconscious for 10 weeks, he worked for years to relearn everything he once knew. Meade woke up to the realization that he would only overcome his limitations by making his own recovery a reality. James P. Meade was a young man who, like millions of other men, went to fight his generation’s war in Vietnam. He left an able-bodied Vietnam combat helicopter pilot and returned disabled. 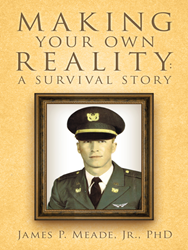 In his new book, “Making Your Own Reality: A Survival Story” Meade shares the story of how he became brain damaged at age 19 as a result of a helicopter crash. After being unconscious for 10 weeks, he worked for years to relearn everything he once knew. Meade woke up to the realization that he would only overcome his limitations by making his own recovery a reality. Now a motivational speaker and the CEO of the Dr. James Meade, Jr. Foundation, Meade has written “Making Your Own Reality” to share his belief that everyone has the ability to make his/her dreams a reality. “Making Your Own Reality” emphasizes that nothing worthwhile is impossible if individuals are willing to work and sometimes be comfortable asking for help. After accepting that his disability was his new normal, Meade knew he had to work harder than the able-bodied individual to regain his skill. He stresses to individuals with disabilities that attempting to do things exactly like able-bodied people do is a dead-end street. “Making Your Own Reality” offers readers an empowering guide to making their own dreams come true. Readers will be reminded that they are in control of their own lives and only they can make their goals become a reality. By James P. Meade, Jr. Ph.D.
James P. Meade, Jr. is the CEO of the Dr. James Meade Jr. Foundation benefiting brain injury organizations. He is a member of the Vietnam Veterans of America, Disabled American Veterans, and Military Order of the Purple Heart. Meade is currently retired and residing in Portland, Ore.